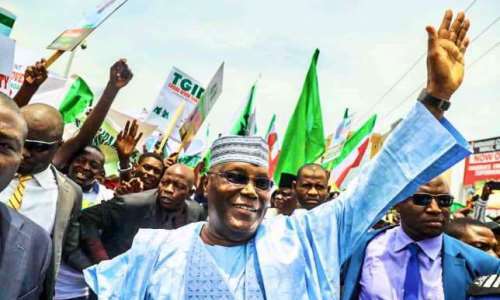 PDP’s presidential campaign in Osun State, the party’s Presidential candidate, Alhaji Atiku Abubakar advised the people of Osun state to protect and defend their votes in the forthcoming general elections. He reportedly said this in Osogbo on Tuesday, when he took his campaign to the state. The campaign had the likes of Prince Olagunsoye Oyinlola, Alhaji Fatai Akinbade and Alhaji Shuaib Oyedokun in attendance. He said President Muhammadu Buhari failed to protect the citizens and assured that he would ensure the security of lives and properties if elected as president. He also promised to restructure the country in a few months if he becomes the next president of Nigeria. Atiku also promised to give the youths and the women large percentage of appointments in his administration as President if elected. Prince Uche Secondus also seized the opportunity to appeal to the new Inspector General of Police, Adamu Mohammed to be neutral and fair to all citizens irrespective of their political affliction.